This ultra-moisturizing hair cream is a versatile styling option for serious control and subtle shine. While helping to minimize fading effects, you can use it as a supreme blow-dry tool for vivacious volume and a soft, natural feel. Use a round brush for an extra lift or a flat iron for sleekness. 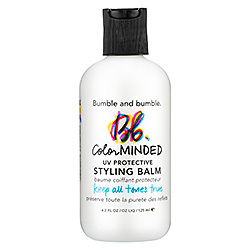 Heat and humidity protection plus UV filters fight the effects of heat styling and sun for all hair types—colored or not.